I was supposed to be making progress on some of the projects that were already under way but one thing sometimes leads to another. When I was finishing up painting in the kitchen, I got sidetracked and started a new one. 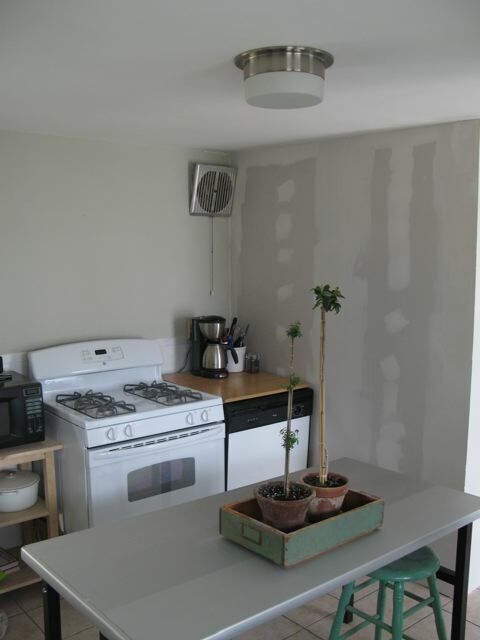 The kitchen has gone through a few different stages. 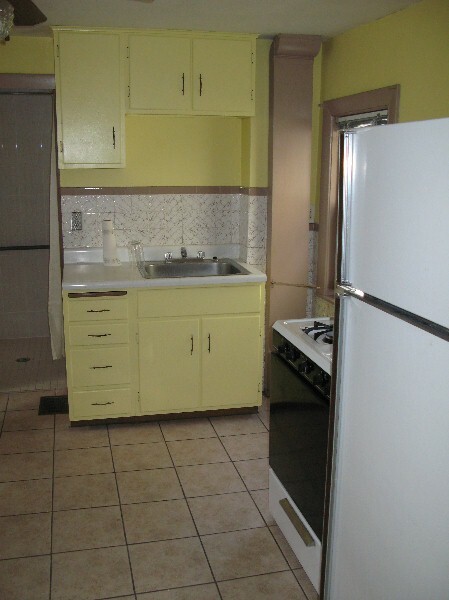 This is what it looked like when I bought the house, the scrambled eggs and band-aids color combo. 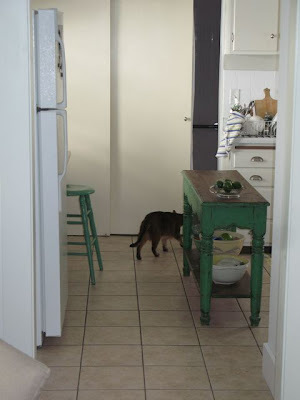 It's been painted a few times including the hideous tile that was primed and painted BM Decorator's White. To make room a new bathroom, I gave up about 2-1/2 feet out of the kitchen. That ended up looking like this. I had a 1960s dishwasher (used only for storage) on one side of the stove, and a microwave cart on the other. 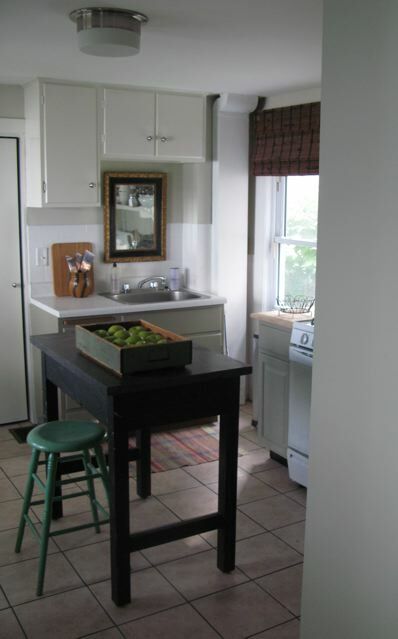 The old table in the middle of the kitchen that used for prep space was too big for the smaller kitchen. I tried the green antique console table which looked great but was too low and too small to be practical. 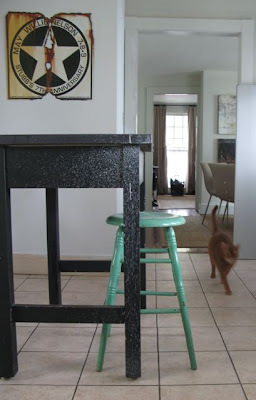 I was lucky to find an old, paint spattered lab table with slate top that was the perfect size and height for an island. A real bargain found in Maine. So, as I was painting, I thought this dishwasher and microwave cart solution was just a little too pitiful. So I scoured the house for Home Depot gift cards and cashed them in for a few adult kitchen cabinets. I primed and painted them with Benjamin Moore Rockport Gray. It was great luck that the top to the old dishwasher and microwave cart fit the cabinets so I didn't have to buy countertop although I have my eye on a butcher block slab at IKEA. Yes, I've decided to go without a microwave. Totally old school. 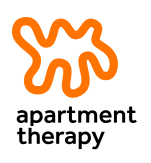 I thought this looked so much better although not a great deal more efficient. As much I loved my vintage cow print above the stove, I thought open shelving would let me keep things I use everyday (and a few snazzy decorative items) right at hand and open up a little room in the cramped pantry. And voila, new kitchen shelves. The brackets are a 10" wood bracket that I painted Benjamin Moore White River. The walls are Sweet Spring. The shelf is 1x8-inch pine to which I tacked a 1x2-inch board on the front to make the shelves look chunkier. You can see what I mean on the end of the shelf (above). But from the front, it looks just like thick slab of wood. I'm still working on where everything goes, but I love having everything at hand. I also added a vintage metal clipboard that's perfect to keep a recipe at eye height. I painted the sink cabinet to same Rockport Gray as the new cabinets. The old upper cabinets match the open shelves for a consistent look. 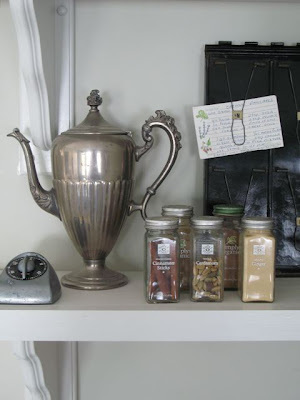 A few weeks ago when I met Carol from House and Home Defined, she mentioned that she liked going antiquing so we made a play date and went to the Cambridge Antiques Market today to look for a few things I wanted for the dining room and kitchen shelves. 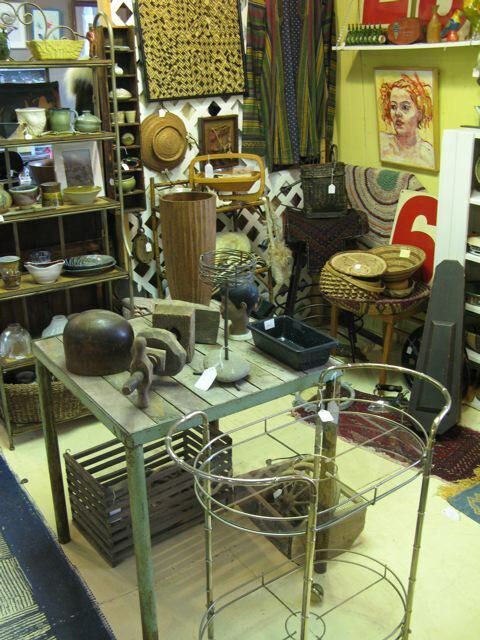 The Cambridge Antiques Market is a multi-dealer store and has a little something for everyone. This was one of my favorite booths. I have real weakness for pottery and this stuff was beautiful. As luck usually has it, you never find what you're looking for but you find a few things you didn't know you needed. I came home with these old mezzalunas and some weird pair of clippers. I think they're great as sculpture. And those have found a home on the wall as you walk into the kitchen. Carol and I had a great time. I can't tell how nice it was for me to walk around such a place with someone who shares my excitement and vision for things. What until you see the little project she talked me into! Sounds like a wonderful day antiquing. I love what you found and they look right at home on your kitchen wall. You've been busy! I love everything you've done in the kitchen. You find the best things in Maine! I love that table with the slate top. I'd go antiquing with you any time. Hi Kitty! BTW, my bottom cabs are fieldstone and my top are white....I love that! I only used it for oatmeal and I can almost a quickly make it in a small pot. Not a big sacrifice. I love Fieldstone! That was in the running for my exterior. I never use my microwave for cooking. Maybe oatmeal on Saturday and heating my bean bag for my aching back. That's it. The kitchen is charming. i love an unfitted look. 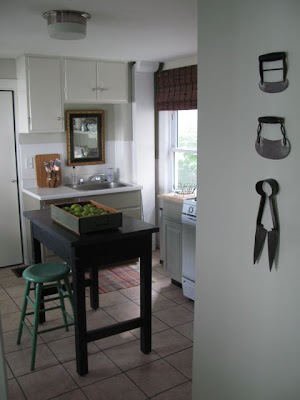 enjoyed this post about your kitchen evolution and all the things that goes into it. I think the shelves look great, how smart are you? Thanks for a great day! Had a blast. I just blogged about it because of what you said when I was pulling out of the driveway -- it was brilliant! When are we going to Maine?? I love this kitchen and if I were livin alone I wouldnt have it any other way ...simple. The kitchen looks beautiful! Love your new decorations! Check Lumber Liquidators for the butcher block, I believe it's VERY reasonable! It is fantastic. Every detail. You are a very talented man. love the colors, the shelving, the table, all the details. it's bed time but I'm going to go grab GG so she can take a look. You have done such a good job on your kitchen. As always, I am so impressed by your thought process along the way and your ability to discard some solutions in favour of even better ones. I believe the old clippers are for sheep-shearing. oooooh Kitchen boy. I like. You remind me of me...I HATE the look of microwaves, and in our old 1800's home in NY I actually kept it in the garage...friends that were over would be like "whaaa?!" The cow...did he find a home on the other wall (next to the stove). LOVE him...he needs to be there somewhere. 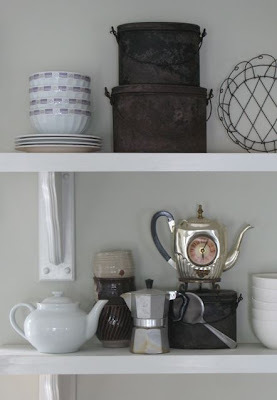 Love the shelves above the stove and that clipboard is a great idea for having recipes close by. What a charming kitchen. Of course I love the cow print, too. I knew I'd love rockport grey! ;) (my iPhone just attempted to change "rockport" to "ticklish"!!). I also really really love sweet spring. And I was at the antique market recently drooling over that vendor's square metal and wood table which you have in the photo! And their vintage number metal signs. Love that green piece that was too small in the kitchen. I hope it got moved to a great new spot! Rockport Gray is a WONDERFUL neutral! I know! That vendor's booth was THE BEST! Gorgeous! Can't wait to see what you're up to next. Love your kitchen (whole house)update. I see a mirror over the sink, I have one over my stove. BTW, I'll be vacationing at the Cape next week (from Texas). I like the choices you have made and I'm looking for a gray. Have to check it out. first, i'm jealous that you are shopping with other women bloggers. second, i never use my micro. 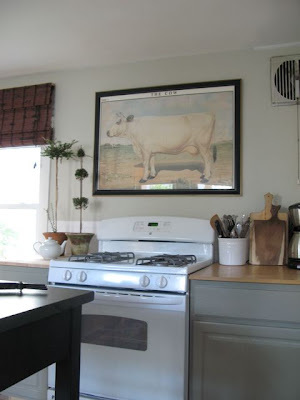 third, i loved the cow above the stove. but that's b/c i don't know how to style shevles. fourth, i like the way the kitchen has that english unfitted look. fifth, it looks real good. Steve, what a great transformation. And once again, you just hopped to it and go it done. Love the little black island and even more the mirror above the sink. Nice contrast, nice shelf styling. Everything looks great. I bet you are very pleased with it -- I would be! Wonderful, you are really talented, to do so much with so little! not much left to do in your kitchen, now. I have a very small kitchen myself, and have come to realize that small kitchens are much more practical for cooking. Now all you have to do is change the floor for some nineteenth century cement tiles, and you are done! And don't buy that idea of knocking down the pantry! Steve...love the new look for your kitchen. Looks more thought out than you give yourself credit for. Really, really nice! 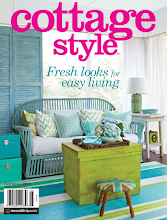 Once again...you hit tha nail on the head when it comes to staging and styling your room. Just caught up with my blog reading and your last three posts. I can't believe what you accomplish in what? A week?! 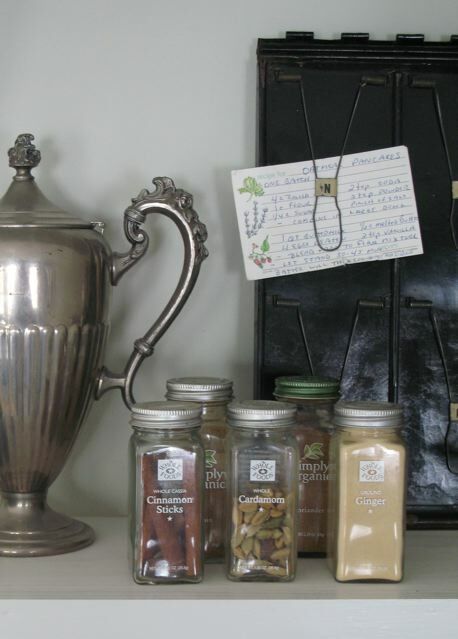 Love what you're doing in the kitchen (and the porch, as well). Love your kitchen wall color and the cabinet colors, and the open shelving. I LOVE open shelving. And I'm with you - who needs a microwave? I have one but can't remember the last time I used it! Keep up the good work and thanks for keeping us all posted! Your kitchen looks so cute. I love the shelves and the table as an island looks perfect. Nice job! Your kitchen looks really good. I like the changes you've made and am in awe of your energy! I have one question...what do the cats' bowls look like? That's an interesting question! The cat dishes are to the left of the stacked black tins on the upper shelf. White dessert plates for wet food and cafe au lait bowls from Cafe Fannie in Berkeley, CA. You are inspiring with your sense of style and design. You have such a keen way of recognizing and pulling together design elements that make things look as though they have been there all along. I'll be in Boston next week and will be sure to visit the Cambridge Antique Market. PS I haven't used a microwave in over twenty years. Very nice! Mine is served his meals from white ramekins until I find something that really suits him. There seems to be a comment missing. Good riddance. I have cow picture envy!!! OK...now I'm pissed. I wanna go antiquing with you guys. Steve...how did you do that kitchen from just Home Depot!!!!! It is SO cute....I absolutely love it. Looks great! I've been dying to go into the Cambridge Antique Mart (Sadly I lived in Inman for five years and NEVER made it - tut tut to me). I've also managed to survive without a microwave for the last four years, and I don't remember missing it ONCE! Your wall art - those are sheep shears. I used to breed and show Hampshire Sheep and so learned how to "block" the fleece for show purposes. When I saw those shears on your wall it brought back wonderful memories. Of course one can use them for clipping grass as well but a true sheepman would cringe. Nice work in the blossoming kitchen. Keep having fun and sharing it with us. My log cabin is coming along. Two logs are in place and the stone mason finished four front piers for the posts that hold up the roof gable. The log lifter is costing me $2000 a month and in 2 weeks lifted 2 logs. The stone mason has another job and will not be back for a month to finish stone facing on the foundation. Building a log cabin is not for the faint of heart or the light of pocketbook. It looks great...but you are a braver soul than I to try and make it thru life without a microwave! Well done kiddo, and by the way, those are sheep shears or wool clippers on the wall. Keep up the good work! WOW!! This blows me away! Ooh, that antiques mart in Cambridge is on my list. It looks fabulous! Notice your kitty had to get into your photos! Mine always do too. I thought I commented on this but then see I did not. I love the new kitchen island..it's so you. Love the shelves over the stove and I really love the mirror over the sink. Love the color you chose for your kitchen cabinets. But then I always love everything you do. How did you NOT buy that brass bar cart at the antique store? I've been looking for one of those. Just took Martha's John Derrian tour. Don't love Derrian. But those horsehair and plaster walls are pretty cool...unless you live there in the winter . BAE, That's something I've always wondered and I've done this as a test to see for myself. 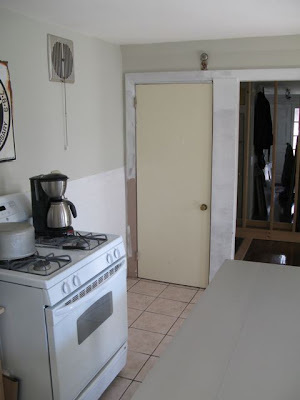 The eventual kitchen which will demo the bathroom and pantry behind the sink to expand the kitchen by four feet, is projected to have a six-burner stove with range hood and exhaust fan and open shelving flanking the stove. If this turns out being a sticky, greasy mess, I'll certainly rethink that plan. So glad I found you! Your house is wonderful and I look forward to following you now. I spent several weeks in the summer for the last few years in Boston while my husband was in school. 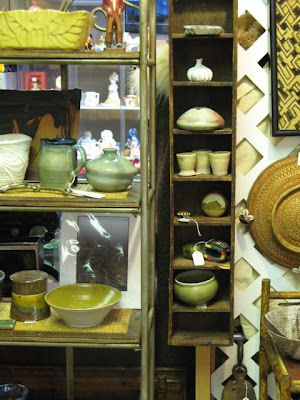 One of my favorite finds was the Cambridge Antique Market - jealous you get to go there as often as you like! Great finds! Just noticed you did list the paint colors...sorry about that. Was so excited about finding your lovely blog I totally missed them. You did a great job-I love your creativity! No microwave in our homes for the past 7 years or so-and I don't miss it at all. Those weird "clippers" by the way are actually old hand shears, for shearing sheep. yes, they are right they are for sheep. talk about back breaking slow work. i have a pair they work great for dead heading old flowers and hang in my tool/garden room. Hello, just to add to the clippers comment, I have two pairs that are only a few years old, made by a company burgeon and ball (have been making them for ages) as topiary shears. Look exactly like those... and work beautifully for small hedges and topiary! ;-) Found your blog randomly today and have spent (hours) time reading and loving your posts and style.